The Nationals Member for Gippsland Darren Chester is pictured with Wellington Shire Mayor Alan Hall in front of works underway at Willow Park. A new toilet block and picnic shelter will be completed by Christmas to encourage more people to stop in Rosedale. Work on Rosedale’s $1.5 million facelift is nearly done, with the streetscape improvements along Prince Street and the shared pathway to Willow Park already finished. 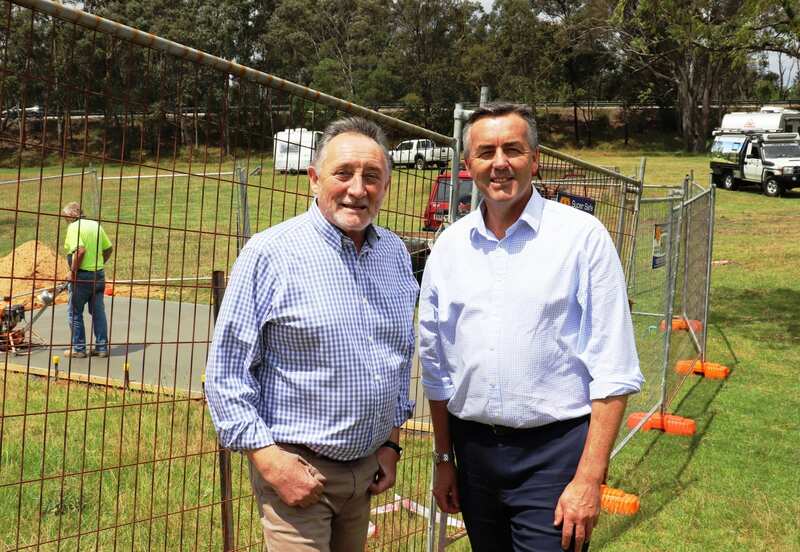 A new toilet block, picnic shelter and access road to Willow Park, which is a popular stop for caravans and motorhomes, are expected to be ready by the end of the year to complete the Rosedale Revitalisation project. The Nationals Member for Gippsland Darren Chester announced $1 million from the Federal Government toward the project to boost Rosedale’s economy. Wellington Shire Council is contributing $500,000 and managing the project. Mr Chester said he was pleased to see Sale-based RAL Constructions has secured the contract for the building works. Another Gippsland business Meluca Group had completed the access road into the park and will return in the new year to complete a turning circle for vehicles once the old picnic shelter is replaced. Trafalgar’s Fowlers Asphalting has carried out the streetscape works along Prince Street. “Local businesses in Rosedale rely on passing traffic, so it’s important we give travellers every reason to stop and spend in the town,” Mr Chester said. “With much of the work done, Rosedale is looking great in time for the many visitors who will be through Gippsland for Christmas and the summer holidays. Wellington Shire Mayor Alan Hall said modern infrastructure was needed to encourage travellers to extend their stay in Rosedale. “The shared pathway is an important addition to Rosedale’s infrastructure as it will be easier for people staying at Willow Park to make the journey to the shops to stock up on supplies or enjoy a meal,” Cr Hall said. “The pathway passes under the Princes Highway bridge and connects to Mill Lane. New signage has been installed to help users find their way to and from the shops. Mr Chester said the Federal Government had spent a further $1 million building a new roundabout in Rosedale to improve road safety, bringing the Federal Government’s contribution for the projects in Rosedale to $2 million. “I think we will see the true safety value of the new roundabout as heavy summer holiday traffic arrives in Rosedale in the coming weeks and months,” Mr Chester said.